...the end goal [is] to establish as consistent all our usual methods of mathematics. With respect to this goal, I would like to emphasize the following: the view which temporarily arose and which maintained that certain results of Gödel showed that my proof theory can't be carried out, has been shown to be erroneous. In fact that result shows only that one must utilize the finitary standpoint in a sharper way for the further reaching consistency proofs..."
(Hilbert, Einführung to [Hilbert and Bernays 1934]). What did Hilbert mean by that statement? Is there a more complete account from Hilbert regarding that statement and what is it? 1) Volume 2 of Hilbert & Bernays, Grundlagen der Mathematik (1939) include full proofs of Gödel's 1st and 2nd Theorems (for the 2nd one, it was the first published complete proof), as well as Gentzen's concistency proof, with detailed discussion of their "impact" on the finitist standpoint. See Wilfried Sieg & Mark Ravaglia, David Hilbert and Paul Bernays Grundlagen der Mathematik I and II : A Landmark. 2) See in : David Hilbert, Lectures on the Foundations of Arithmetic and Logic 1917-1933 (Wilfried Sieg ed - 2013), the Introduction to the Appendices, page 788-on, regarding Hilbert's lectures of the '30s (and thus, "affected" by Gödel's Theorems). "One step in this direction [ enlarging of the methods of proof theory, from the original finite Standpunkt ], made by Hilbert himself, was to replace the schema of complete induction by the stronger rule later called infinite induction (“Die Grundlegung der elementaren Zahlenlehre” (1931a) and “Beweis des Tertium non datur” (1931b))." [see page 24]. Hilbert 1931a brings in a new technique to address syntactic completeness questions for arithmetic, whereas Hilbert 1931b formulates quite novel, but also somewhat obscure, directions for further proof-theoretic work. It is clear that they react to what Hilbert and others in his School knew at the time of Gödel’s Incompleteness Theorems, and are important at the very least on that account. The last paper is also significant since it influenced Gentzen’s early attempt, starting in late 1931, to establish the consistency of full elementary number theory. Wilfried Sieg, Hilbert's Programs and Beyond (2013) : II Analyses : Historical, page 129-on. The reaction of Hilbert to Gödel is described in detail by Solomon Feferman in Gödel on finitism, constructivity and Hilbert’s program (2011). Hilbert was unaffected by any of the reconsiderations of the possible limits to finitary methods in pursuit of his consistency program that had been stimulated Gödel's work. In fact, there are no communications between Hilbert and Gödel and they never met. Perhaps the second incompleteness theorem on the unprovability of consistency of a system took Hilbert by surprise. We don’t know exactly what he made of it, but we can appreciate that it might have been quite disturbing, for he had invested a great deal of thought and emotion in his finitary consistency program which became problematic as a result. There is just one comment, of a dismissive character, that he made about it four years later in his 1934 preface to Volume I of the Grundlagen der Mathematik. This is his sole reference anywhere to Gödel or his incompleteness theorems. Hilbert writes [quote translated in the OP]. So it seems the answer to the OP's question is "No, Hilbert did not pursue the objections raised by Gödel". Other contemporaries did, as explained in Hilbert's Program (2015), but apparently not Hilbert himself. ... a variant on what the OP quoted. 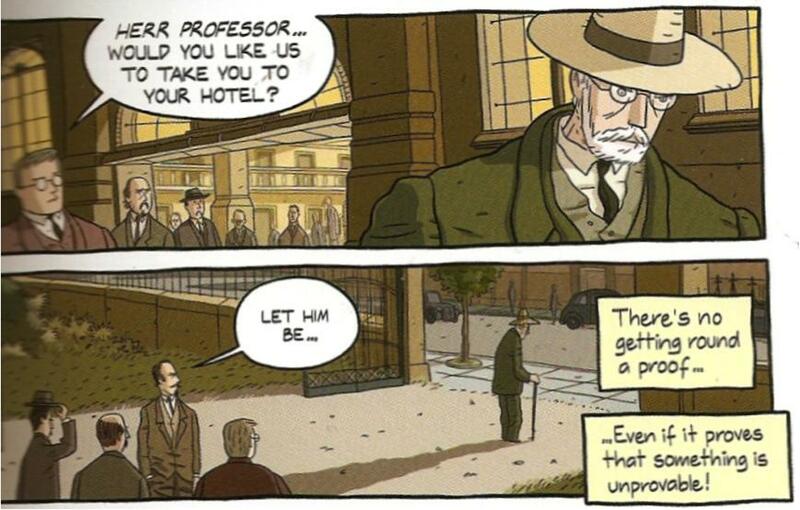 Here's the Logicomix account of Hilbert's reaction. Perhaps a reference to Hilbert's Hotel? Here is a relevant reference not mentioned so far, which in a sense (taking the strong statement I cite below at face value) gives an answer to the OP, and is so new that perhaps this is unknown to the OP. I am posting this since I just stumbled about this thread while reading the chapter that I quote from below. It definitely seems on-topic for this thread. "But Hilbert was, by no means, a philosophical hardliner. The only piece of written evidence which we have about Hilbert's reception of Gödel's result [emphasis added] is the cryptic short preface in the first volume of the Grundlagen der Mathematik , saying that Gödel's result "shows only that---for more advanced consistency proofs---the finitistic standpoint has to be exploited in a manner that is sharper [...],"11 i.e., the philosophical starting point was to change. Bernays and Ackermann provide us with two additional testimonies that Hilbert soon adapted his "meta-mathematical standpoint." [emphasis added] Based on Bernay's reports, Reid [whose writing about Hilbert seems to be thought of as substantiated by actual historical research; see e.g. the AMS obituary] writes about Hilbert's reaction to Gödel's result [ Constance Reid: Hilbert, p. 198] "At first he was only angry and frustrated, but then he began to try to deal constructively1 with the problem. Bernays found himself impressed that even now, at the very end of his career, Hilbert was able to make great changes in his program." Ackermann writes in a letter to Hilbert (August 23rd, 1933)12: "I was particularly interested in the new meta-mathematical standpoint which you now adopt and which was provoked by Gödel's work." Unfortunately, we have no sources which explicate in detail Hilbert's new standpoint, but it goes without saying that Gentzen's work was in line with it. "[Hilbert and Bernays, p. VII]. German original: "Jenes Ergebnis zeigt in der Tat auch nur, daß man für die weitergehenden Widerspruchsfreiheitsbeweise den finiten Standpunkt in einer schärferen Weise ausnutzen muß, [...]." German original [Kahle here gives a reference to a letter of Ackermann to Hilbert, apparently kept by the Universitätsbibliothek Göttingen]: "Besonders interessiert hat mich der neue meta-mathematische Standpunkt, den Sie jetzt einnehmen und der durch die Gödelsche Arbeit veranlaßt worden ist." The letter was written after Ackermann visited Göttingen, but didn't meet Hilbert and spoke only with Arnold Schmidt, who informed him about "everything" [Kahle does not indicate what sort of quotation marks these are, i.e., whether these are scare quotes meant to indicate that 'everything' is used ironically, or quotation marks indicating that someone is cited here] going on in Göttingen. (0) Kahle makes a strong statement 'the only written evidence we have' about what is, in a sense, only a semi-decidable problem (to think, e.g., of Hilbert's boxes Reid found in Göttingen), and this statement of Kahle's essentially says that what the OP quoted is the only historical evidence of how Hilbert reacted. (1) The answer to the question "What did Hilbert mean by that statement?" in the OP seems to be: "No one really knows, yet much can be extrapolated from what Hilbert did in the ten years after this statement." 1 Reid's use of 'to deal constructively with the problem' is a little awkward in this context, for obvious reasons. Here, scare-quotes would have been in order. Not the answer you're looking for? Browse other questions tagged reference-request lo.logic soft-question ho.history-overview mathematical-philosophy or ask your own question. what was Hilbert's geometric construction in his 17th problem? What was Gödel's real achievement? 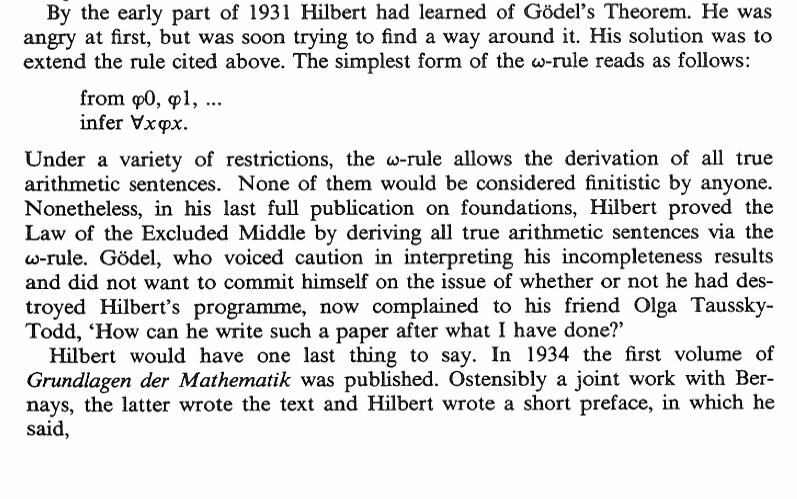 Was “arithmetical translation” (coding in the Goedel sense) ever a part of Hilbert's Program? What was Gödel's Constitutional Problem? What are the axioms used to prove Gödel's incompleteness theorem?